Having two keiki, 3 years old and 11 months old, I'm immersed in stuff from "baby talk" to children shows to cartoons to toys to clothing. If there's anything dat stays constant, it has to be nursery rhymes. I sing da ABC's - with a BL twist at da end of course - Itsy Bitsy Spider and Twinkle Twinkle Little Star to name a few. Now dat Da Keiki is in preschool, she now knows quite a few more like Wheels On The Bus, B-I-N-G-O and Old MacDonald. It's amazing how these songs nevah seem to fade away yeah? There are also some local terms dat seem to "stick" at da "baby age" like bocha (bath), nene (sleep) and mum mum (eat/food) although da last term I found out isn't so local aftah all since there's actually a baby food brand called Mum Mum. I couldn't believe it cause I ALWAYS thought dat was a local term - didn't mattah which generation or race - and it was something dat as we grew up, we always heard and said and passed on to each generation. There are some "terms" we've either grown up with or have been saying recently which I have a feeling will be passed on from my keiki to their's. I say "Oi" (in a deeper, scolding kine voice) when calling out something they're not supposed to be doing. I say "whoo-sha" when swooping them up like an airplane (sounds bettah than reading it). And one thing I'm regretting saying more than my fair share is, "watevah" in da sassy-I-no-like-boddah-already kine voice cause my 3 year says it to da T and uses it in da right context and tone too! Wat have you grown up with dat is "universal"? Have you your own nuances dat you've passed on to yours? If you have keiki, wat shows have you watched dat weren't in your time? I'm glad Sesame Street is still on and even still has Gordan and Maria! 😯 I'm glad dat there are educational and social cartoons out there as my daughter has actually learned a lot from da likes of Dora, Diego, Jake and The Neverland Pirates, Sid The Science Kid, Octonauts and Bubble Guppies just to name a few. Being a "band geek" - and no, I am NOT offended by dat term as I think it's kinda endearing - I've been surrounded by music of all sorts. From Symphonic Wind Ensemble to Jazz Band to Marching Band just to name a smidgen of bands I was a part of throughout high school to playing tenor sax, alto sax and my absolute favorite, bari(tone) sax... not to mention a bass clarinet player in da Symphonic Orchestra and a drum major (no instrument in case you're wondering) in da Marching Band as well. Band geeks represent..... Wassup Wit Dat! My involvement in music has made me appreciate da rhythms and beats of many different genre's from classical to rock to R&B and their associated different styles and moods. Shmall kid time I loved (still do) da "oldies" and those Al Green type recordings and I was exclusively Hawaiian/Jawaiian in high school. There was some time listening to pop/dance in college to "bust a move" "in da club" 😉 and now, I guess I listen to old people music on KSSK 92.3 and KRTR 96.3. I love da flashback station of 93.9 JAMZ and listen to them on my way home from work and I still have to get my fill on KINE 105.1. I hands down though put acapella music above all as they show a "pure" voice - no Milli Vanilli action going on there. I remembah spending some time listening to an acapella group performing on da sidewalk in downtown Seattle and ending up buying their CD. I have to admit dat I enjoy country music as well but more of a song lover rather than a group/band fan though I enjoy many songs from Loretta Lynn and Kid Rock so I guess you could say I am fans of them. There's a show called "The Sing-Off" on NBC and it absolutely rocks! Straight up acapella music and da winners of season 4 was a...... country group! Each of their songs were put together amazingly but one in particular you have to listen to if you appreciate musicality is "Ring of Fire" featuring the bass player - it'll make your jaw drop. Wat kine of music you listen to? Wat radio station are you tuned in to? You have favorite songs or favorite performers? Any type of music flows through your veins? It's funny how blogs are almost one-sided: I write, you read, pau. Well, da brave ones post a comment - which I SINCERELY enjoy - but really, it's a pretty lopsided affair in dis digital world as da comments don't come flying in as they used to. Back in da hanabatta days, I tink regardless of generation, we all "signed in" a slang book. You know da one get all kine questions ranging from listing your best friends to your worst school subjects and at least wen I was shmall kid, it was usually in da hard cover black and white composition book. Which reminds me, we used to color da covers in crayon, then color ovah all dat with a black crayon, then use a paper clip we straightened out as a "pen" to graffiti da cover unveiling da colors - anybody do dat? Sorry, shmall kine Uncle Rodney MLC flashback. Wen you tink about it.... dat was old school original "FaceBook" action going on eh? We kept in touch, found out wat your friends - and people you nevah know - liked and didn't liked, you could even "ignore" friends by not giving 'em da book and even "text" in da last pages. 😆 Da only thing nevah have was a "Delete" button. *** Wat's your favorite color? *** Wat's your favorite grindz? *** Wat's your favorite snack? *** You evah wen beef? Who wen win? *** Wat was your favorite subject in school (high school or college)? *** You can swim? Surf? Float? *** Wat's one show dat you get recording on da DVR? *** You addicted to anything? *** How many electronic gadgets do you have on you today? Da questions kinda general cause we dunno wat kine wackos reading.... well, you gotta be kinda off if you still reading WWD! anyways. 😛 So answer 'em fo' realz or make 'em funny or add your own questions too if you like to keep it going - guarantee I going answer 'em! Graduation is right around da corner - if not hea already - and wat's da first thing we in Hawai'i nei go for before heading down to da footbal field, stadium or arena? Das right, one lei..... or two or three or four or howevah much you need for da graduate and his/her hui. We seen - and smelt - it all. Plumeria, hibiscus, ti leaf, maile, carnation, ribbon, feather, quarters, dimes, nickels, pennies, beer (rogah, I've seen dat EVERY year some barely 18 year old get a six pack of beer probably from da "fun" uncle), inflatables, haku..... does dat cover it? Those heading down to graduation looking to be da "different" relative? Da one who da graduate will remembah dat gave a cool gift? How's about a gummy lei? It's not wat you tink wea it's just a single row of gummies but how's about a POUND of gummies (three rows) braided so cleanly and tight dat you swear it was a "real" lei? E Komo Mai Sweet Lady Lei (www.sweetladylei.com). • Do you physically make each lei? 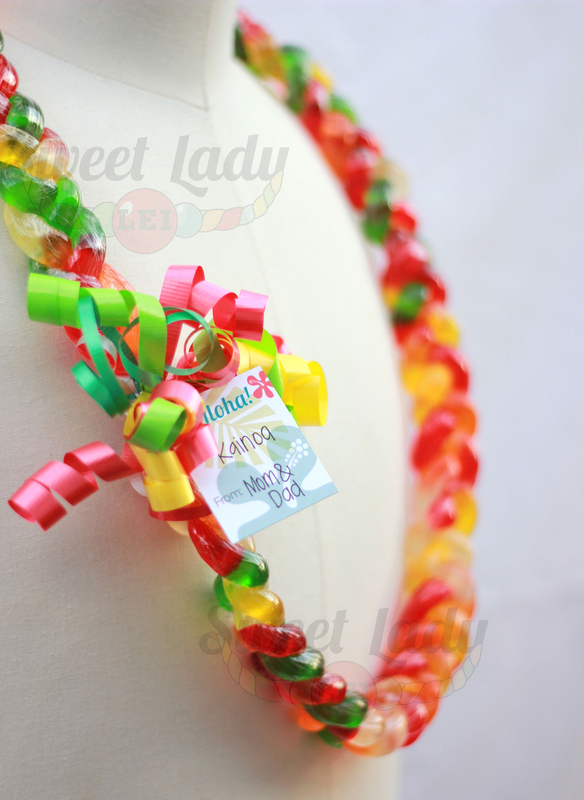 Yes, the candy is manufactured in the USA and each lei is handmade in Hawaii by me and my business partner, Nel Ota. Made in Hawai'i - das wat we like to hear! Plus it "stays" in Hawai'i too! • How did da “gummy lei” come about? I love gummy candy and my good friend Nel loves crafting, so we created the lei during a late night brainstorming session with gummy snacks! Ummm, "late night brainstorming session"? We launched in April 2013 for graduation season and it was so popular we continued it year round since then. In addition to our website (www.sweetladylei.com), we are now wholesaling at Watanabe Floral, Primo Popcorn, and Samurai Snacks. • Do you eat any of them while making them? No lie. No, LOL!, but I have tight quality control standards so the ones that do not pass the test go into a “samples” jar that I usually end up eating or giving away. Sure, I will offer 15% off the entire order if they order online and mention the blog. Primo, Watanabe, and Samurai will not honor the discount so please make sure you mention it applies to website orders only for the 15% off promo. Eh, no complain if you nevah follow directions by not mentioning dat you saw it on WWD! eh! Click on ovah to their site, (www.sweetladylei.com) and order there. Their turnaround time is really quick but in da same breath, it is grad season so they are getting slammed and working feverishly to get out all their orders. • Any fun facts you want to add? FUN: this is the perfect gift for any occasion because it is the gift that keeps on giving. Shelf life is 9 months at room temperature, so you can wear it and then eat it. All candy is sealed for freshness and comfortable wear. We make bracelets and leis – bracelets range from $5-8 and leis range from $10-20. It’s a unique, one of a kind, gourmet gift that is easy to transport. HISTORICAL: Gummy Worms were created in 1981. The Sour Worms are the #1 selling gummy worm in the US. The first gummy candy was invented in Germany in the 1920’s and did not come to the US until the 1980’s – the same year the Gummy Worm was created. The largest Gummy Bear in history is from Texas in 2011 – 81 lbs! Ha ha ha. I just re-read dat sentence out loud in my head....... 😆 if you no get 'em, nevah mind. All I gotta say is dat their website is VERY AWESOME! Lots of pictures, clear cut descriptions and excellent detail. Check da site (www.sweetladylei.com) for full details and no fo'get to mention dat you saw it hea on WWD! for your kama'aina discount. Five Shakas and A Howzit! We've all had graduation or been to one and a lei is a lei and once on and piled high, you really don't pay much attention to it but trust me, whoevah gets a gummy lei will remembah who gave it to them. Compared to a floral lei, you'll be spending close to - if not more - so you might as well get something unique dat is memorable. They also do gum balls too! Keep in mind dat it's not just for graduation though but for anytime you want to give a lei.